we just want to bring more smiles to it! This making-people-smile mission lead to the idea behind Voozies. 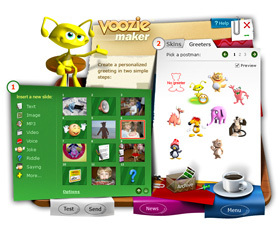 A Voozie is a surprise communication that carries warm and fuzzy feelings. A Voozie can make its recipient roll with laughter or quiver with happy tears. A Voozie can uniquely express your gratitude, forgiveness, congratulations, or any other emotion! Voozies are a brand new medium for personal messages - a medium that allows you to share photos, attach voice recordings, add music, and do so much more. Best of all, it keeps these files small, for easy Voozie-sending. Your Voozie is also delivered by a special postman character-picked by you-whose moods and actions you control. Start sending Voozies to your friends, family, and coworkers today! They will love getting Voozied by you!